During the configuration of the Filr appliance, you configured Novell Filr to communicate with your email system, as described in Changing Outbound Email Configuration Settings in the Novell Filr 1.0.1 Installation and Configuration Guide. As a result, Filr users can send email messages to other Filr users and to anyone whose email address they know. They can also send email notifications when they create folders, add files, share files and folders, and so on. This option applies to all outgoing emails sent from the Filr system. In the Send E-mail Notifications section, adjust the schedule of digest notifications sent from the Filr system to meet the needs of the majority of your Filr users. Users can receive digest notifications for folders when they subscribe to a folder (as described in Subscribing to a Folder or File in the Novell Filr 1.0.1 Web Application User Guide) or when someone configures folders to send notifications to others (as described in Configuring Folders to Send Email Notifications to Other Users in the Novell Filr 1.0.1 Web Application User Guide). Users can turn the digests on and off for individual folders, but they cannot change the email schedule that you establish. 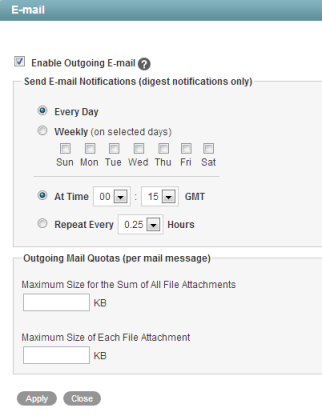 (Optional) To set a data quota on outgoing mail messages, specify the quota limit in the Maximum Size for the Sum of All File Attachments and the Maximum Size of Each File Attachment fields. By default, there is no limit to the size of attached files. You can leave the fields blank to retain the default of no limit. To restrict any attachments from being sent, specify 0 in each field. For information about the options that users have for receiving email notifications, see Subscribing to a Folder or File in Getting Informed in the Novell Filr 1.0.1 Web Application User Guide.